I was watching the grandkids play and perusing a shelf of older books. A title, Calico Captive by Elizabeth George Speare, caught my eye. Before long, I was reading and glancing over at the kids from time to time. When I taught middle grades (long, long ago) I used Speare’s The Witch of Blackbird Pond as one of my class novels. I’m not sure that all of the students liked it, but I did. Calico Captive, like “Witch” is an historical novel, with a young adult protagonist. Nowadays, many novelists write for younger audiences, and the readership is quite broad for such novels. Everything from Harry Potter and the Sorcerer’s Stone to The Hunger Games (Book 1)to The Princess Diaries are squarely aimed at YA, but caught on with adults and movie audiences, too. Speare’s novels are very well written and could have a varied audience of entertained readers. Instead of re-cycling old television shows, maybe some film makers will decide to put Elizabeth George Speare’s tales into production. This novel would make a great movie! Calico Captive tells the story of a young woman, Miriam Willard, living on the frontier in the 1700s; first captured by Indians, then held more or less as a prisoner of war by the French, during what historians now call the French-Indian War. According to my research, this is Speare’s debut novel, and it is based on a real life story. Miriam and her fellow captives are portrayed in a manner that held my interest. Okay, it is not quite a page turner, as it strives for some historical accuracy meaning that this all takes a while to resolve, but this story also helped me learn about a period of history that I don’t know well at all. Readers who love history and are looking for a well written novel with adventure and a hint of romance will really enjoy this story. Speare’s later, better known works, are good reads also, but I have genuinely enjoyed this window into another time. Netflix? Hulu? Amazon? Come on, let’s get these stories into production! I’m not sure why we didn’t watch it when it was new, but hubby and I were perusing a list of the best films available for streaming on Netflix, and we chose to view Steven Spielberg’s ode to the controversial president. Gosh, there’s been so much written about this man. Historians can easily demonstrate how controversial and even unpopular Abraham Lincoln was during his lifetime, but since then his stature has ridden the waves of popularity, sometimes to heroic heights and then again to be mostly forgotten. I’ve read some of the books and articles on Lincoln, but there’s many, many more that I haven’t. Still, the film version has much to offer viewers, regardless of their prior knowledge of the civil war era leader. For the two hours plus of runtime, the film focuses on the struggle to pass the 13th amendment to the U.S. Constitution, the one which prohibits slavery, except as punishment for criminal behavior. Daniel Day-Lewis does a remarkable job of portraying the title character. Sally Field is also very good as the mercurial Mary Lincoln, and the supporting cast is peppered with famous and talented actors. When we paused the streaming version for a pantry raid, hubby and I commented that it was as if the script had been tailored to showcase some aging but remarkable players, including Tommy Lee Jones and David Spader. Mostly, this is a really good film, but the beginning, although dramatically effective, leads a well-read viewer to question its authenticity. The soldiers who quote from Lincoln’s now famous address at Gettysburg seem so sincere, but it is quite unlikely that war weary soldiers would know by memory that speech, as it was not considered to be much good when it was delivered. History has given those words their significance. Although I don’t remember the source of the recommendation to watch this film, I, too, endorse it. While the outcomes are not really suspenseful, the film holds the viewer’s interest. No biopic is entirely historically accurate, of course, but the spirit of truth is certainly present. Watch (or re-watch) and enjoy! 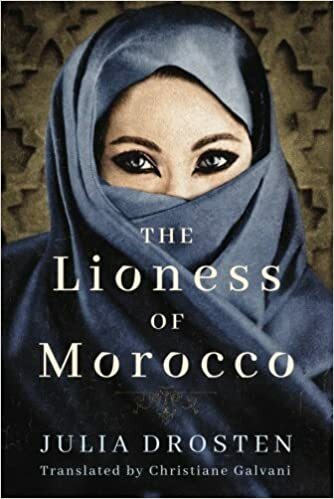 The Lioness of Morocco is quite a saga. I mean that in a positive way, but some readers may not be ready for a yarn that covers this many years. I, on the other hand, relished it, like a home cooked meal after a long stint of eating fast food. This story reminds me of the “mini-series” that were once a staple of television networks: a multi-part yarn that covers much of the adult life of an interesting main character, often with a lengthy list of co-stars. Such sagas usually combined romance, suspense, and mystery, and The Lioness of Morocco does that fairly well. The protagonist, Sibylla Spencer, is a good (if not fabulous) character, sufficiently well developed that readers should want to follow along with her travels and travails. Although the story begins in England, before long her adventuresome nature, combined with her father’s shipping business, leads her and her new husband to Mogador, Morocco, where she grows into an even more bold woman, sometimes called “The Lioness” in part due to her mane of golden hair. As an Englishwoman, Sibylla could either cling to all things British, from her clothing and her companions, to her language. Or, she could learn more about the Moorish population, learn their language, and (perhaps) do a bit of business with them. She follows the second course of action, which does cause her more straight-laced neighbors to be a bit put out with her. However, she is well-mannered and well-bred and manages to keep both sides of her world reasonably happy with her most of the time. The novel is set in a tumultuous time, so there are plenty of plot twists, but the reader is never rushed, as this story happens over a number of years. Much of the Moroccan culture is revealed via detailed descriptions, which I genuinely enjoyed. Several crises occur, from the time her husband is accused of trafficking slaves to being the family being involved in trade wars and political wars. However, Sibylla and her children seem to rise to the occasion, whatever comes their way. I did find this to be a very satisfying novel, rich in history and culture, if not a compelling read. For anyone who hasn’t enjoyed a saga recently, I suggest this novel. It is available as a paperback and in eBook form. We had an interesting discussion about celebrating America’s Independence Day, and the ways to celebrate are as diverse as the country itself. Most of the towns around here offer some sort of fireworks, usually preceded by live music, and people bring lawn chairs and visit for a while. When our kids were kids, we usually visited the one in the town where we lived. Currently, we live out in the country, so we don’t usually bother. Hubby wants to watch a movie, preferably Independence Day Resurgence. We loved the original ID4 movie, but somehow we missed seeing the sequel. Despite its mediocre reviews, I imagine that we’ll be looking for that one in a couple of days. In my work as an adjunct instructor, I work with students from lots of differing situations, but some of the most interesting are immigrants to our country. Many of them are just so appreciative for the opportunities that Americans have. I remember one gentleman, originally from Romania, who came over a couple of decades back, beginning with nothing but some work ethic. At first he made his living doing odd jobs. He worked his way into owning his own construction business, and he and his wife raised their family through hard work and savvy real estate deals. At our college, he was working on his HVAC (that’s heating and air-conditioning) certification, as he wanted to open an HVAC business so he could scale back doing difficult construction work as he aged. Being a very smart business man, he said that in the south making money on repairing air conditioning was a sure thing! One day at the end of our class, he spend probably half an hour, telling all of us about what a wonderful country we were living in, because he could never do all that he was doing in the economically and socially constricted country of his birth. It was quite refreshing. Sometimes, caught up in the polarized morass of modern media, Americans forget just how wonderful our country is, and how it differs from others. When I mentioned that it can be difficult teaching young children about our country, one mother of youngsters mentioned that when they are driving in the car, her kids count flags. Regardless of the destination, they look for the red, white, and blue symbol of our great country. That, too, is a great way to begin celebrating the good ol’ US of A. Happy American Independence Day, y’all.